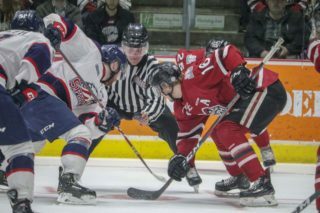 That’s the way it’s been so far between the Guelph Storm and Kitchener Rangers in their best-of-seven opening round playoff matchup. 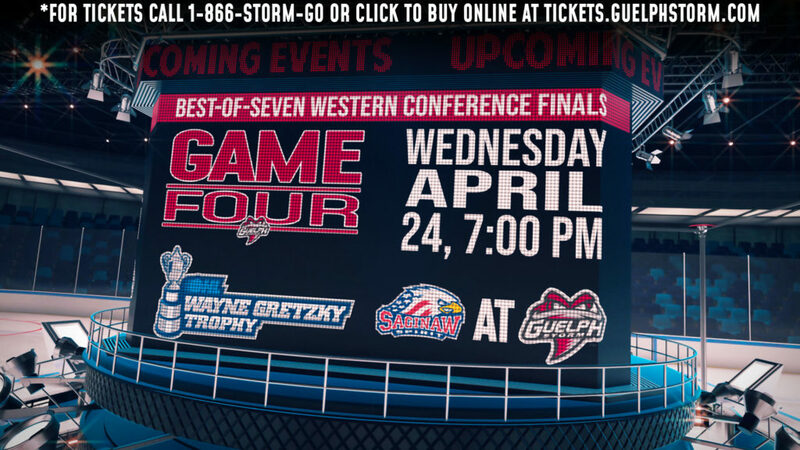 Wednesday night at the Sleeman Centre it was the Storm’s Anthony Popovich stealing the spotlight for the second night in a row, making 39 saves as Guelph evened the series at two apiece with a thoroughly entertaining 6-4 win. 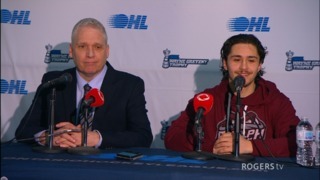 Kitchener won the first two games largely on the play of their goaltender, Mario Culina, now the Storm has won the last two in large part because of Popovich. “I’m guessing that’s pretty common at playoff time,” Storm coach George Burnett said of the goaltending being the difference in each game. 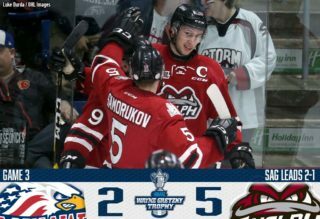 Trailing 2-1 entering the second period, the Storm scored four unanswered goals to take a 5-2 lead into the third period. 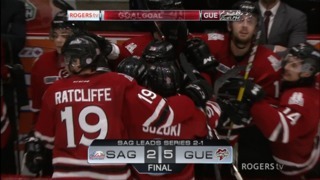 Culina, who was clearly off his game, got the hook after the Storm’s fourth goal. Rangers head coach Jay McKee said he tried to rally his troops by reminding them that Culina had bailed them out in several games, and that it was their turn to bail him out. McKee said he “wasn’t going to make a knee jerk reaction” on who would start in net for his team in Game 5. As expected, the Rangers made a game of it in the third period despite trailing by three, scoring twice in the opening eight minutes of the period to make it a one-goal game and outshooting the Storm 16-1 over the final 20 minutes. “We knew they’d be coming at us pretty hard there in the third period, but my plan was to treat it like a 0-0 game,” Popovich said. “Even when it was 5-4 I treated it like a 0-0 game.